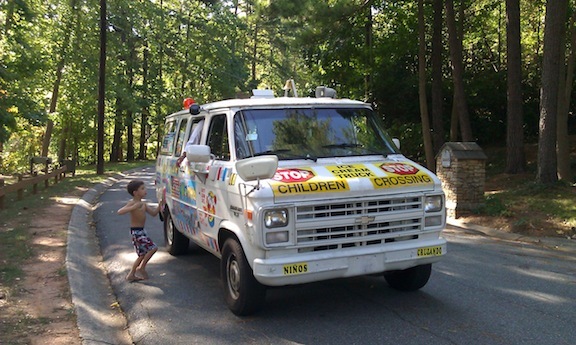 The ice cream truck has arrived in Vinings! 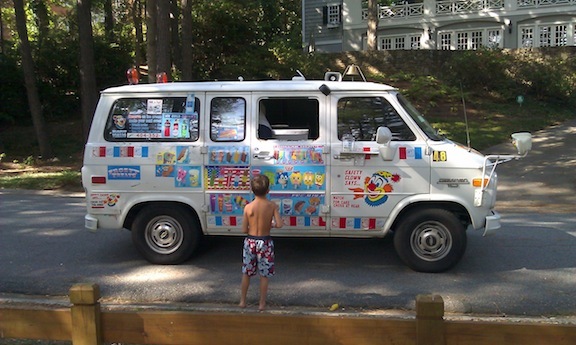 Residents of Vinings must be hearing the bells and speaker from the ice cream truck! We were used to hearing them at the beach, but in Vinings this is a relatively new thing. We first started hearing the familiar ring of the ice cream truck a couple of months ago and now it’s pretty regular. Fortunately she usually hits our street after dinnertime so it works out well for us. We’ve heard the ice cream truck on Teton and Orchard Knob already too, so I figure she’s most likely on all our streets. Kids walk run to the ice cream truck in Vinings! If your street doesn’t have the ice cream truck stopping by and you’d like her to, let me know and I’ll pass the information along. This entry was posted on October 13, 2011, 8:49 am and is filed under Living, Vinings. You can follow any responses to this entry through RSS 2.0. You can leave a response, or trackback from your own site.